It comes down to this….Four weeks from the state meet on this same course, the top ranked individuals and teams on the boys side and all but one of the top ranked girls, Karen Xiang, and the top ranked teams on the girl’s side gather for their last top level race before they are propelled into the state series. Throw in some talented teams from Alabama, Tennessee, Georgia and South Carolina, some expected temperatures in the low 60’s and we have the makings of a very special set of races. Expect some defining moments in this race as the top teams gauge their racing mettle against the state’s best in a championship atmosphere. 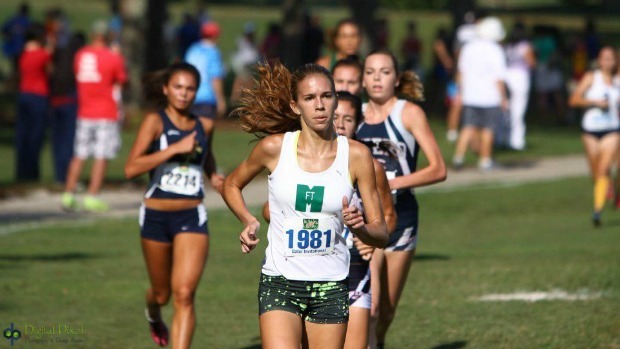 Fort Myers senior Emily Edwards and St. Thomas Aquinas sophomore Alexa Cruz have traded places in each of their last two head to head races, Mtn Dew and flrunners.com 14 Invitational. It came down to the final straight at flrunners.com where Edwards summoned an extra gear to catch Cruz. Flashback to the Mtn Dew race, Holy Trinity junior Julie Wollrath beat them both by a wide margin. And just last week at the Great American ROC in Cary, NC, Oak Hall senior Brittney Olinger edged out Wollrath by five seconds. 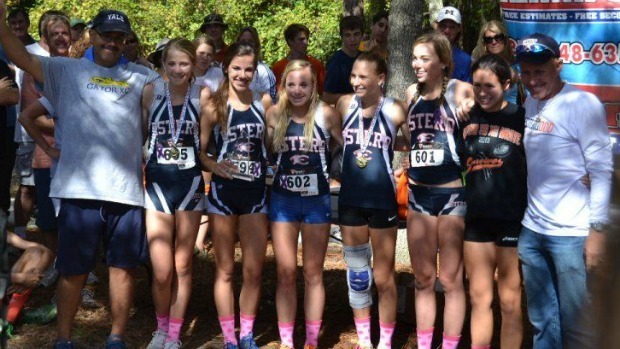 Throw in Estero senior Araceli Leon’s big win over Edwards at the Nort Port Invitational and Gulf Coast senior Caroline Barlow and Cardinal Mooney senior Grace Casagrande’s fantastic performance for a close third atflrunners.com and we have a myriad of contenders. At flrunners.com, the pace went out sluggishly the first 800m before Nease senior Karen Xiang took the reins and ran off with the title. Edwards has run from the front at Mtn Dew and from the pack at flrunners.com. Wollrath has toyed with different strategies as well while Cruz has always run even paced. With the field being so close together and no clear front runner, this may be a tightly bunched pack until the final mile. Things will get a bit interesting from there where Edwards has shown a knack for closing fastest. Unless someone is able to get away early and hammer away a la Karen Xiang, expect this to come down to a spectacular finish with Edwards coming out on top. Estero (pictured above) is on a roll. They have won every head to head meeting against the state’s best. However, their number two runner, Bethany Jenkins was taped up with Kinesio tape, hobbling a bit after crossing the finish line and having a panged climb up the award stairs at flrunners.com. Couple that with a20:18 at the Land O’ Lakes Invitational and the Wildcats look a bit vulnerable. Junior Megan Slater has provided some needed support as she has improved over three minutes and to 19:50 and is closing on her personal best of 19:35 set on this course at the FHSAA Cross Country Finals. Estero will be hard to topple, but with any chink in the armor, they could leave themselves open to an upset. Winter Park, Holy Trinity and Oak Hall have been trading places all season long. However, the Winter Park Wildcats have gotten the best of Oak Hall in their last head to head at flrunners.com. Holy Trinity also pinned a win over Oak Hall at the Great American Race of Champions. Oak Hall will be without number 2 runner, Lauren Perry this week so they may be a little shorthanded. Though I wouldn’t count them out since they have some young upstarts who rise to the occasion when challenged. Winter Park will see if their reinvigorated group keeps improving. The Wildcats run with a lot of poise in big races and work together to tackle the challenges that arise in the races. The camaraderie seems to be paying off and with continued improvement, the Wildcats could close the gap on the very strong Estero team. Holy Trinity has made up some ground on Oak Hall at last week’s Great American Race of Champions. Sophomore Sydney Smith was rounding into shape running 20:01 on September 21, but has not raced since. They should give Winter Park a better race this week than at Mtn Dew with her. And what about St. Thomas Aquinas, the number 1 ranked team in the state in the preseason polls? Coach Trish Butler said she aims towards the end of the season and they are certainly headed that way with their top four. Add senior Christian Kalis who ran 20:23 on Thursday at the Fort Lauderdale City Championships and Marina Braynon-Moore who has slashed 67 seconds off her time in two weeks and the Raiders looked to be improving. We’ll see how far they have come this Saturday. What a field?!!! 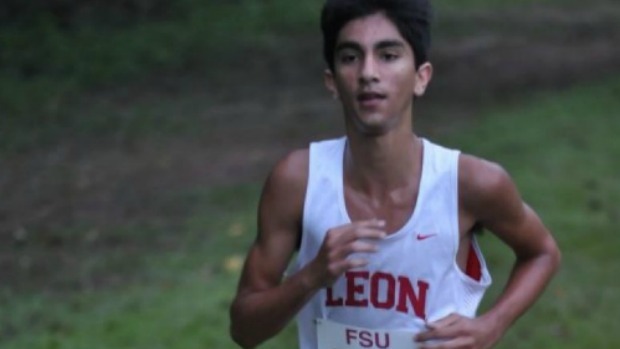 Leon junior Sukhi Khosla has looked under control all season and pasted a very good field at Alligator City by 21 seconds with a state leading time of 15:08. Sunset junior, Nick Diaz, used a superior kick to outlast Niceville senior Nick Morken and turn back a once seemingly invincible Fort Myers senior Tyler Bennett to win a very deep flrunners.com field with a solid 15:15. Throw in Vestavia Hills senior Mac Mcoy, winner of the FSU Relays 3200m last year(9:07 if you do not remember), Niceville senior, 3A state defending champion and Apalachee Regional Park high school course record holder(15:19.6 at the FHSAA Cross Country Finals last year), Walton(GA) senior Kenan Farmer, a 9:11 3200m performer, a reborn Coral Reef junior, Kurt Convey, and a solid Belen junior, Ryan Rodriguez and we have the makings of a super-fast, course record breaking field. Only Tyler Bennet has shown the moxey to take the pace out fast in races, though at flrunners.com, he was not able to run away from the pack. Sukhi Khosla has run with the pack in both his wins, but once he turned it on he decimated the fields. And Nick Diaz hung with the pack at flrunners.combefore pulling away on the end from Nick Morken in the final straight. Diaz has transformed himself into an elite over the past year. He’s improved by 30 seconds over last year and his flrunners.com win gave him a renewed confidence finally reaching a dream from his early running days. He should have the mettle to hang with Khosla when he does move. How long he can stay with him remains to be seen. Nick Morken was just a step behind Diaz at flrunners.com. He and teammate Thomas Howell are on the right trajectory for improved performances and a rematch with Khosla will definitely be added incentive to race well. Tyler Bennet may have been reassessing himself after flrunners.com. The senior looked sensational at Mtn Dew and had a bad day at flrunners.com. Possibly, he’ll have a better day on Saturday could parlay itself into a shot at the title. Mac Mcoy was only rated #5 heading into the Jesse Owens Classic on October 5, but won by seven seconds in a time of 15:16. The FSU Relays champion is rounding into shape nicely and he’ll definitely be challenged for the second week in a row. This may be the venue for him to ascend even higher. Kurt Convey got a big monkey off his back at flrunners.com running a personal best of 15:24. He had an off year as a sophomore and with the breakthrough has a renewed confidence that made him a bona fide threat as a freshman. 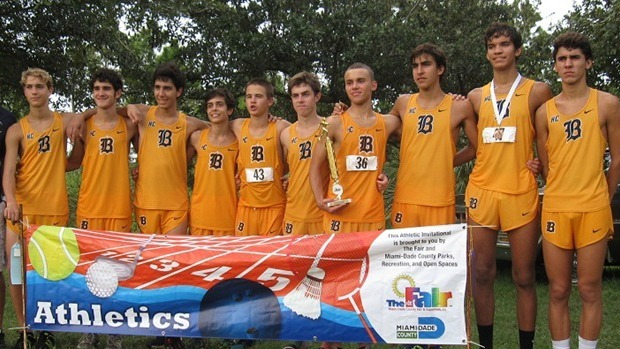 Another sophomore, Ryan Rodriguez of Belen had a breakthrough at flrunners.com running 15:29. He came back with a 16:02 at the Great American ROC. We’ll see if he is able to get back on track this weekend against familiar faces. Lastly, don't count out Timber Creek sophomore Brandon Marquez. Marquez has run in four races this season and won all four including his first of the year at the Katie Caples Invitational in Jacksonville. His team opted to go to the Manasota Invitational last weekend instead of flrunners.com so he hasn't seen a ton of elite competition since week one. His 15:17.00 he posted at the Overbay-MonteCarlo Invitational is the fifth fastest time this year in the field behind Khosla, Diaz, Macoy, and Morken. The last time he ran at this course he finished second in the 4A Cross Country Finals as a freshman. So, my prediction…a tactical race. But not in the traditional sense. Khosla seems to have the edge. Running in his home town, sleeping in his own bed was definitely something he favored in his flrunners.com interview a few weeks ago. The junior has been underraced and has shown an uncanny brilliance in his wins. Those in the field will be watching his every move closely for his move which may be too much for anyone to handle. Like Estero on the girls side, Belen has won every head to head competition against Florida teams. Unlike, Estero, they are incredibly deep going 7 deep with a 1:24 spread. They will be incredibly tough to beat. They run well on flat courses, they run well on hilly courses. They run well everywhere. They will be ready for this one too. Behind them is closely contested set of teams in St. Thomas Aquinas, Fort Walton Beach, Chiles, and Trinity Prep. Those teams are separated by a mere 14 points in the virtual meet. On paper, it is hard to pick one who will emerge from the group, but if I had to pick one, it would be Chiles. Coach Scott Gowan preps these kids for each race and this one in their hometown will be one he will have a focus on. The Wolves will need their typically solid races from their top five and with such close-knit group, one or two other their runners could be spurred on to a break through. St. Thomas Aquinas is next best. Senior Tony Cruz is still on the mend and has run 17:02, well off his personal best of 16:17 from the FHSAA Cross Country finals last year. Coach Butler said she was going to bring him along slowly and this may be a good litmus test to see how far along he has come. They are solid without him. Manny Velasquez was a bit disappointed with his flrunners.com race. He could be more geared up for this big race on the state meet course. He wanted to have a complete season and he is just four weeks away from that. Unlike the other aforementioned contenders, Fort Walton Beach has a nice 1-2 punch in Trey LaNasa and Charles Shackelford. In this deep race, their performance may be key. If their top three can match Chiles’ top three, they may have a chance though they don’t have as deep a team as the Wolves. Trinity Prep is on the cusp as well. They have the narrowest 1-5 spread, 15 seconds, and 1-7 spread of 31 seconds of all the teams. That leaves them with a lot more room for error. Anyone on their team could step up. So, all I have left to say is Wow!! May the winds be at your back and the hills not be so steep. May the footing be great and everyone run their best. And may the best team and individuals come out on top and Seize the Day!